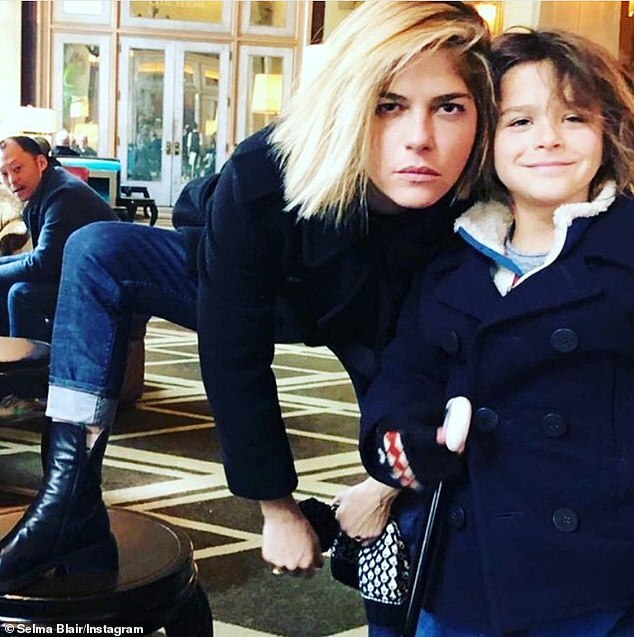 Selma Blair has revealed that her shock multiple sclerosis diagnosis actually came, in part, as a relief because it finally provided her with an answer to questions about her health that she had been asking for years. 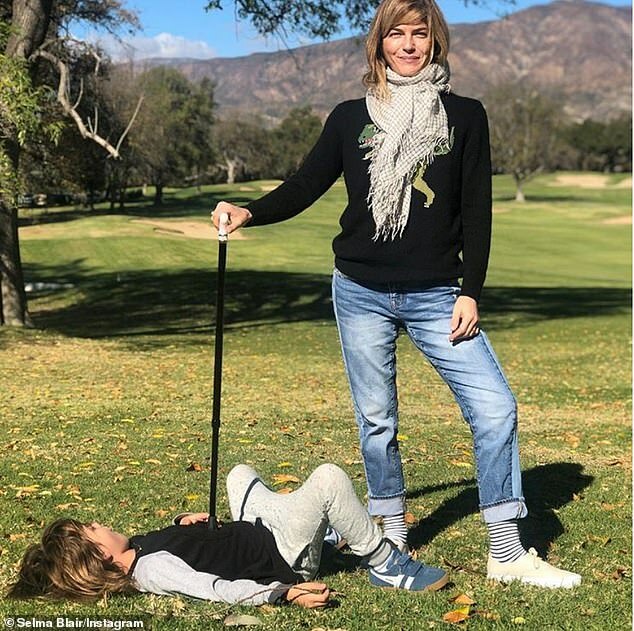 The 46-year-old actress, who opened up about her ongoing battle with the chronic disease in a new interview with GMA anchor Robin Roberts, recalled the moment that she was told she had MS, after spending years living ‘in pain’ with an undiagnosed condition that doctors simply passed off as the result of her being an ‘exhausted single mother. ‘I cried, I had tears,’ she said of her reaction to the diagnosis. ‘They weren’t tears of panic. They were tears of knowing I now had to give in to a body that had loss of control. That struggle to seem normal, Selma admitted, involved self-medicating whenever she was not around her son Arthur, now seven, as well as drinking heavily in order to cope with the pain and exhaustion that she was struggling to combat. ‘I was self-medicating when [Arthur] wasn’t with me,’ she said. ‘I was drinking, I was in pain. Multiple sclerosis (known as MS) is a condition in which the immune system attacks the body and causes nerve damage to the brain and spinal cord. It is an incurable, lifelong condition. Symptoms can be mild in some, and in others more extreme causing severe disability. MS affects 2.3 million people worldwide – including around 400,000 in the US, and 100,000 in the UK. It is more than twice as common in women as it is in men. A person is usually diagnosed in their 20s and 30s. The condition is more commonly diagnosed in people of European ancestry. The cause isn’t clear. There may be genes associated with it, but it is not directly hereditary. Smoking and low vitamin D levels are also linked to MS. Symptoms include fatigue, difficulty walking, vision problems, bladder problems, numbness or tingling, muscle stiffness and spasms, problems with balance and co-ordination, and problems with thinking, learning and planning. The majority of sufferers will have episodes of symptoms which go away and come back, while some have ones which get gradually worse over time. Symptoms can be managed with medication and therapy. The condition shortens the average life expectancy by around five to 10 years. Selma’s years-long struggle to deal with the symptoms of what was then an undiagnosed chronic illness came after she tried to seek help from multiple doctors, who refused to ‘take her seriously’. 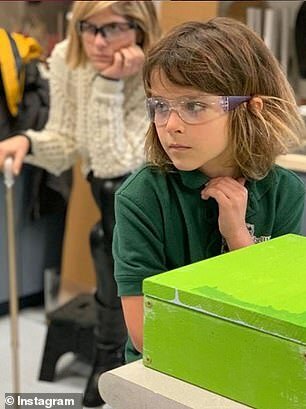 The actress, who first revealed in October that she had been diagnosed with MS, explained that some of the medical experts she saw simply passed off her symptoms as being the result of her being ‘exhausted’ and a ‘single mother’, with others even blaming her ‘hormones’ for her physical struggles. It reached a point when Selma was so tired, she was unable to stay awake in between dropping her son, whose father is her ex Jason Bleick, off at school and going to work. ‘I got to the point where I said, “I need to go to work and I have to stay awake.” I would drop my son off at school a mile away, and before I got home I would have to pull over and take a nap,’ she revealed. She was, however, able to find a source of support and advice in the form of fellow actor Michael J. Fox, who was diagnosed with Parkinson’s – a neurodegenerative disorder – in 1991. Selma explained that she reached out to Michael – whom she had never met before – via email before being diagnosed with MS, because she thought it was possible that she had Parkinson’s. ‘I said, “I don’t know who to tell but I’m dropping things… I’m doing strange things,”‘ Selma wrote to the actor, who is now 57. ‘He got in touch with me, and we began a conversation. So he really helped me. Plus I have Michael J. Fox’s email now, like I’m pretty cool, I’m cooler than I thought! When it came to telling her son about her diagnosis, which she did shortly after the MRI that confirmed it, Selma said it wasn’t a difficult conversation – and revealed that the pair had actually already been joking about her symptoms. ‘[It wasn’t difficult] at all,’ she recalled. ‘I always want him to feel safe and never responsible for me. Her son’s only fear, Selma recalled, was that his mother’s disease might be killing her. ‘I did have to tell him after the MRI,’ she told Roberts. When the interview took place, Selma was suffering a ‘flare-up’ of her ‘aggressive’ multiple sclerosis, an attack that is also often referred to as an ‘exacerbation’ or a ‘relapse’, and which can cause new symptoms to appear, as well as the worsening of old symptoms. For Selma, that impacted her speech in particular, with the actress explaining that she was suffering spasmodic dysphonia as a result of the attack, a condition that causes the muscles which generate the voice to into spasm, resulting in shaking, stilted speech. But while Selma admitted that the worsening of her symptoms made her ‘scared’ to speak on camera, she did so in the knowledge that her appearance on the show might help others to better understand the disease and what life is like for sufferers. Looking ahead to the future – both near and far – Selma says her outlook is incredibly positive, adding that she has learned to accept the limitations that her condition creates, without feeling as though she is giving up or giving in to the disease. ‘I get in bed and I don’t move,’ Selma said of her reaction when she is having a ‘difficult day’. ‘You just have to, you can’t do it all! It’s fine to feel really cr***y and say, I gotta. 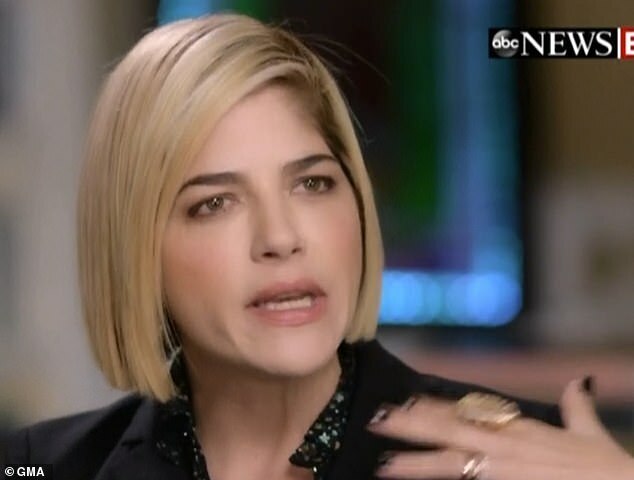 Although she was going through a particularly aggressive flare-up during her GMA appearance, Selma said her doctor has told her that she could well recover 90 per cent of her abilities ‘within a year’. But even if that doesn’t happen, Selma says she will consider it ‘good enough’ if she is still able to sit down and have a conversation, adding that she wants to do another similar sit down in 12 months to ‘see for other people and see for me where I am’. Selma’s GMA interview, which aired on Tuesday, comes just hours after she penned an emotional message about her first red carpet appearance since being diagnosed with multiple sclerosis (MS) – a milestone moment that saw her breaking down in tears while posing for photos at Vanity Fair’s Oscars party on Sunday evening. The actress took to Instagram the day after the star-studded event to share a photo of her manager Troy Nankin holding her hand as she walked the red carpet with the help of a cane. ‘There are moments that define us. This is one of those indelibly watermarked in my heart. This is #troynankin; my former publicist turned manager, best friend, and fake husband. We joke,’ she began her post. 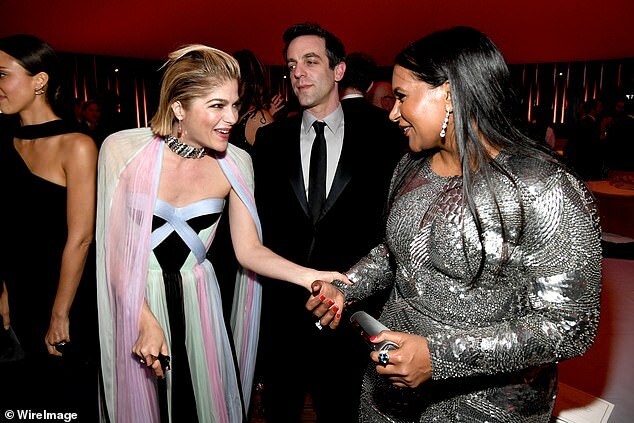 Selma said she wanted to make an appearance at the red carpet event to remember the first time she attended the Vanity Fair Oscars party in 2000 with her ‘not yet famous friend’ Jake Gyllenhaal. There are moments that define us. This is one of those indelibly watermarked in my heart. This is Troy Nankin; my former publicist turned manager, best friend , and fake husband. We joke. I have become a different woman in the last few years, through struggles and the intense pride of motherhood. Vanity Fair has always been a champion of mine, like Troy. And yet, I have not fully realized my capabilities as an actress. I wanted to be at this red carpet to remember my first time attending with a not yet famous friend, Jake Gyllenhaal. I believed in him and his career and wanted him there. And I kept going because it was always a night in Hollywood that was full of Hollywood dreams with all the talent present in their glory. I loved to watch. I was invited this year. I am featured in March issue . Thank you @radhikajones @kristasmith @samiranasr #juliemiller @cassblackbird. So this was a streak of light. To say I am here. I am still in an exacerbation so there was some nervousness. I don’t do anything the way I was once able. I will though. I can regain much. Mommas gotta work. And I will be able to do so much more on my own, But this man. Until that comes …This man and a host of others light the way and hold the moon. @thetexastroya was a hero. Wanting me to shine brightly in a time that can be so challenging. He knew I wanted to be able to stand proudly as the woman I have become and hope to be. To be a part of something so special when my body won’t move clearly yet. And then I felt the love from the photographers who have watched me goof around on red carpets since I was in my twenties. I felt the warmth of the bulbs. The strength of my gown. His attentive touch. And still I hoped my brain could send signals for the remainder of my time there. And I sobbed. And I appreciated every single second. Every surprising tear, he was there. As he has always been. And that is the reason I could. Thank you Troy. We got me just where I wanted to be. For a night. And I later pushed my way into a family photo with Diana Ross (omg) . So much to post but not before this one. True love. Right here. Forever. The People v. O.J. Simpson: American Crime Story star, who appears in the March issue of Vanity Fair, explained she was invited to the magazine’s annual Oscars party this year but was concerned about attending because she has been experiencing a flare-up of MS symptoms. ‘So this was a streak of light. To say I am here. I am still in an exacerbation so there was some nervousness,’ she wrote. ‘I don’t do anything the way I was once able. I will though. I can regain much. Momma’s gotta work. And I will be able to do so much more on my own. ‘But this man,’ she said of Troy. ‘Until that comes … This man and a host of others light the way and hold the moon. Selma looked stunning in a multi-colored dress by Ralph and Russo and a thick choker featuring an attached floor-length cape. She completed her ensemble with a large ring on her left finger and a black cane that she has been walking with since her MS diagnosis. At one point, she was overcome by emotion and broke down in tears, saying, ‘It took so much to come out here,’ as the crowd cheered her on. After wiping the tears away, she continued to walk the red carpet with the help of a cane before entering the party. The actress opened up about the emotional moment, writing: ‘To be a part of something so special when my body won’t move clearly yet. And then I felt the love from the photographers who have watched me goof around on red carpets since I was in my twenties. Selma ended her post by once again thanking Troy for being there for her when she needed him. While enjoying the bash, she happily shared a photo of herself with Grey’s Anatomy creator Shonda Rhimes. When she returned home after her night out, she took to Instagram Stories to make a plea for her 867,000 followers to support the Leuser Ecosystem in Indonesia. In the series of videos, she explained that her friend Pink nominated her to join designer Stella McCartney’s #ThereSheGrows campaign by dedicating a tree to help save the endangered forest. 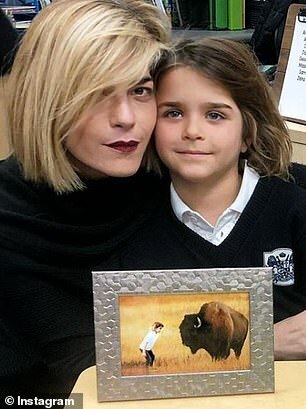 Selma, who dedicated a tree to her seven-year-old son, Arthur, asked her friends Sarah Michelle Gellar and Kris Jenner to do the same while raising awareness for the Leuser Ecosystem. ‘The Leuser Ecosystem is an endangered forest in Indonesia and it is home to the endangered Sumatran orangutan and it desperately needs our help and attention,’ the actress explained. 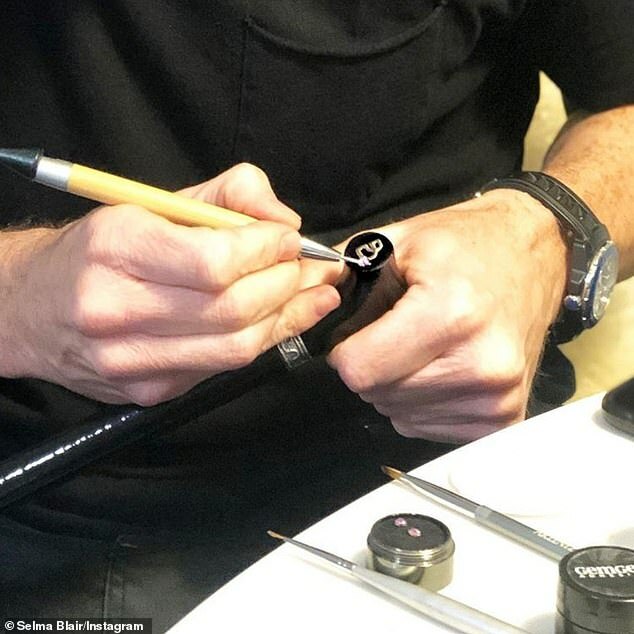 Ahead of her appearance at the Vanity Fair Oscars party, Selma posted an Instagram photo that showed some of the work that went into customizing her cane for the evening. Selma revealed in October that she had been diagnosed with MS a few months before, after living with symptoms for years. Her diagnosis has not stopped her from working, and she was recently cast in the upcoming Netflix series Another Life. She also has appeared in two movies that are in post-production, After with Meadow Williams and Jessica Beals and The Great Illusion with Ireland Baldwin.